As we enter our third year of the EDEN2020 project, we are delighted to be able to share with you our publications and research findings to date. Working together to develop an integrated platform for one-stop diagnosis and minimally invasive treatment in neurosurgery, our Consortium members are making significant advances towards its completion. 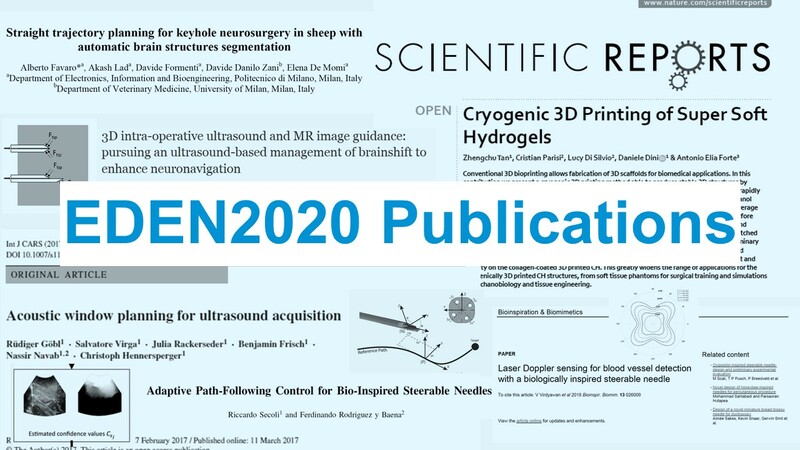 To date the Consortium has pushed the state of the art in terms of intra-operative ultrasound imaging, needle steering, and realistic tissue modelling, and details can be accessed online. All of our publications will be available to download via an open access repository. We hope that the information and data published will provide researchers, clinicians, engineers and those interested in medical robotics with the appropriate insight and understanding of the project’s aims and potential outcomes. A full list of the publications and relevant links can also be viewed on our Publications Page. Each of our publications below are available to view pending ending embargo periods.